Kawai CN Series wins MMR Magazine’s ‘Dealers’ Choice’ Award | News | Kawai Musical Instruments Manufacturing Co., Ltd.
Musical Merchandise Review (MMR) magazine has announced the results of its 2017 ‘Dealers’ Choice Awards’, naming the CN Series digital pianos as ‘Home Digital Keyboard Line of the Year’. The latest CN Series of digital pianos were introduced in early 2017, and combine Kawai’s Responsive Hammer III keyboard action with Progressive Harmonic Imaging sound technology to deliver an authentic grand piano playing experience at an affordable price. With a variety of convenient features, the CN27 and CN37 models are the first CN Series instruments to incorporate Bluetooth® technology. This modern feature allows pianos to communicate with smart devices wirelessly, enabling players to enjoy a wide range of exciting music-related apps that enhance their learning and playing experience. The ‘Dealer’ Choice Awards’ were established in 1992, and have gained a reputation as one of the musical instrument industry’s foremost accolades. 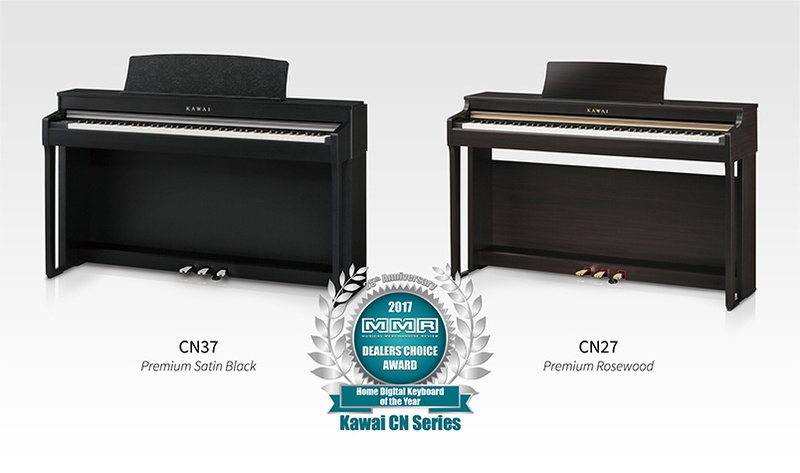 During this time, Kawai’s RX Series grand and K-3 upright pianos have proved a dominant force, winning their respective categories for several consecutive years, while the CN Series digital line has also received multiple awards. This year’s success increases Kawai’s tally of MMR trophies to a total of 19, and reflects the company’s long-standing popularity among retailers and customers.